Fresh is best, say hen owners seeking repeal of city ordinace. Photo by Tory Germann. A community group committed to sustainable, organic farming hopes it doesn’t ruffle any feathers in gaining support to legalize the ownership of hens in residential areas. The Lowell Backyard Chicken Group is a community campaign launched to repeal a city ordinance that currently forbids owning chickens in Lowell. “This is a critical opportunity for Lowell,” says Rachel Chandler, program coordinator for the Lowell Farmers Market and chairwoman of the grassroots Food Security Coalition, a group of private citizens examining ways to ensure all residents have access to clean food that’s reasonably priced. “I want the freedom to be independent and responsible for procuring my own clean food for my family and neighbors,” Chandler said. Under the group’s proposal, hens would need to be kept in a clean and secure enclosure located at a reasonable distance from a neighbor’s home. Roosters would be prohibited because they can crow loudly in the morning and aren’t needed for hens to produce eggs. The group supports owning up to six hens maximum, contingent on the size of the backyard space and enclosure accommodations. It also stresses the importance of defining guidelines which set good health standards and incorporate educating the public on good farming practices. A city ordinance now bans farm animals and forbids owning any fowl within city limits, except pigeons. Pigeons must be licensed and coops fall under the scrutiny of city building code and zoning requirements. Lowell Health Director Frank Singleton said nationally, a huge push for locally grown food and farming — known as the “locavore” movement — has prompted several cities to adopt rules allowing chickens, honey bee keeping and the cultivation of produce for sale. “I think Somerville did it the right way,” said Singleton, referring to the most densely populated New England city’s newly adopted rules for urban agriculture. Somerville allows residents to raise chickens, but caps the number at six per household. Chicken owners are required to clean coops at least once a week and compost the manure. Permits must be obtained by residents seeking ownership of chickens and cost $50 for the first year and $25 for every year afterward. “Urban agriculture is a part of that,” Caragianes said, adding that some people were already keeping hens illegally for fresh eggs. The issue in Lowell needs to be thoroughly and thoughtfully weighed by city officials, but if done right, allowing residents to own chickens can have benefits without causing problems, Singleton added. Isla the hen and Lowell resident Marianne Gries want city support for backyard hens in Lowell. Photo by Tory Germann. 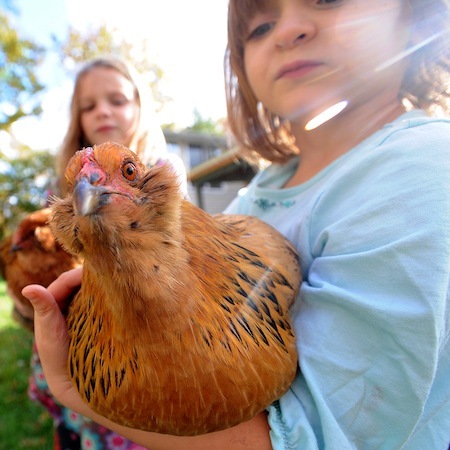 Lowell resident Marrianne Gries supports the backyard chicken cause, explaining that hens make great pets, would save residents money on eggs, reduce food and yard waste and keep away mosquitoes and other garden pests. In addition to Somerville, the cities of Springfield, Providence, R.I., Portland, Maine and New Haven, Conn. have already passed supportive legislation that legalizes owning backyard chickens. Those cities have also implemented regulations to satisfy neighbors. Chandler said the Lowell group is committed to working with city officials in providing community education and outreach to make sure people owning backyard chickens are well equipped to properly care for the animals. Locally grown and organic food, she added, is becoming such a widespread movement due to large factory farms with poor agricultural practices that have lead to major food recalls in the recent past, including eggs from salmonella and listeria contamination. The group’s next step is bringing its proposal before the city. For more information on The Lowell Backyard Chicken Group, contact hensinthehood@gmail.com or visit Lowell Chickens on Facebook.